When facing challenges working with English learners (ELs), start with an empathetic approach. These students often feel overlooked, left out, and confused in school situations. Body language, facial expressions, and tone of voice can let them know that you care. 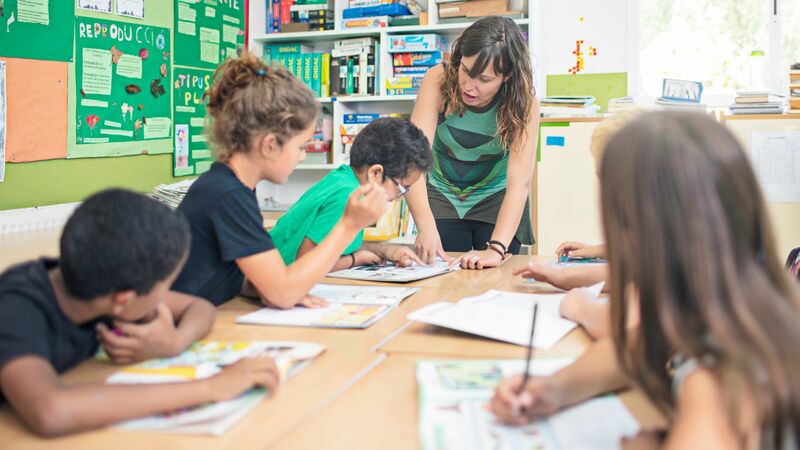 Creating a welcoming environment provides a foundation for learning, and the once you’ve established that environment, you can support these students in their language acquisition with a few simple strategies. 1. A picture is worth a thousand words: A picture is understandable in any language. For English learners who may not comprehend everything a teacher says, an image will help clarify meaning and encourage understanding. Whenever you introduce new vocabulary, couple a picture with each important word. For example, when I taught Romeo and Juliet, I gave my ELs a handout of five to six vocabulary words they would encounter in each scene we were studying. The handout had the word in English, a picture, and a place for students to write the translation of the word in their own language. I also projected the words and pictures on the board and explained each one. After we read the scene, I posted printouts of each word with its picture and added them to a word wall. Long or dense texts may be overwhelming to ELs. Including images can boost comprehension and stamina. Consider adding images to assessments or any printed directions for activities. 2. Check for comprehension frequently: Often ELs will not tell you when they don’t understand something because they don’t want their classmates to know. Using quick formative assessments can help determine where more instruction is needed. Turn and Talk is a useful strategy because it reduces the anxiety that ELs often feel when asked to speak in front of the entire class. Turn and Talk may be modified for ELs by providing a sentence starter or asking them to write down their answer before sharing it with a friend. Observing students during a Turn and Talk activity is useful for evaluating student understanding. Exit tickets are short written activities usually given at the end of a lesson to check student comprehension. Including a sentence starter or picture support on an exit ticket is an easy way to scaffold learning for ELs. In assessing student comprehension, it’s important to check in frequently. After giving directions for an activity, check in with ELs and restate the expectations if needed. Model the task if it appears the directions were not sufficient. Checking for comprehension and providing clarification provides repeated language practice for students who are still developing proficiency with English. 3. Use sentence and paragraph frames: Many ELs in my classroom, especially less proficient learners, are shy about speaking in front of the class. In addition, they struggle to form grammatically correct responses to questions. To address this, I provide sentence frames during class discussion. Sentence frames can also be helpful in writing activities. English learners often find writing activities daunting because of the high linguistic expectations of academic writing. Providing a syntactical model may lower anxiety. _____ and _____ are similar in some ways and different in some ways. They both _____. Also, they both _____. They are different because _____, but _____. Another difference is _____. However, _____. I recently used a paragraph frame of cause-and-effect with fifth-grade ELs. Students had to use the signal words to infer whether to write a cause or an effect. We underlined signal words as a scaffold, but students needed to correctly identify causes and effects of a destroyed house. For students who can’t write a cause-and-effect paragraph independently, this paragraph frame gave them the support they needed to communicate causes and effects. 4. Chunk texts: Reading academic texts is a challenge for ELs because of the complex academic vocabulary, complicated syntax, and density of text. One strategy is to chunk passages into short, manageable sections. For each passage, choose two to three key vocabulary words and provide pictures of those items. Allow ELs to translate the words into their native language if they’re unfamiliar with the terms. After each chunk of text, ask ELs to write a one-sentence summary of the section using the vocabulary words in their sentence. Then move on to the next section of text. When I taught Martin Luther King’s “I Have a Dream” speech to high school ELs, they found it challenging. I broke up the speech into five sections, and we spent one class period on each section, focusing on vocabulary and message. Each day, we worked together to find the most important quote from that section, rewrote the quote in simpler language, and illustrated it. After five days, I gave the students a card sort with our five quotes, five paraphrased quotes, and five images and asked them to match the items. Then they had to write a summary of the entire speech. Breaking down the larger text made it easier for the ELs to build content knowledge.